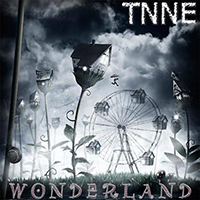 Three years after “The Clock That Went Backwards”, the Neo-Prog band TNNE from Luxembourg is back with their second release on the Progressive Promotion Records label entitled “Wonderland”. TNNE stands for The No Name Experience. A lot of progVisions readers will remember that wonderful “The Secret Garden” album of the band No Name that was released on Angular Records, a sub label of Musea Records. After 23 years and releasing four albums (“Zodiac”, “The Secret Garden”, “The Other Side”, “4” and a compilation album (“20 Candles”) the band dissolved in the year 2011. Vocalist Patrick Kiefer and keyboardist Alex Rukavina somehow revived the band and together with some new members they formed TNNE. In the year 2014 the band released their first album “The Clock That Went” Backwards on the Progressive Promotion Records label. We will have a closer look now at the successor “Wonderland”. To be honest I missed the first TNNE album but I have original copies of the No Name albums “The Secret Garden” and “The Other Side”. Happily surprised I can inform you that the spirit of that “The Secret Garden” album is also present on “Wonderland”. But maybe this is the case because vocalist Patrick Kiefer has an exceptional voice. A warm and remarkable voice which has some resemblance with the voice of RPWL vocalist Yogi Lang. Together with the keyboards of Alex Rukavina this ensures a recognizable and unique band sound. Another surprise is the corporation of Chilean guitarist Claudio Cordero who at this moment is also the guitarist of the Mexican band and label mates Cast. With his qualities as Prog and Metal guitarist he brings a somewhat heavier edge to the sound of the band. “Wonderland” opens with the track “My Childish Mind” which is divided into the parts “Opening” and “The Thrill”. The first part has some jazzy influences through the use of the saxophone of guest Fred Hormain. The basis of the music of TNNE is keyboard oriented. Besides the melodic synths and nice guitar solo’s you can also find some delicate piano work in this fine opener. In “Eye Of The Storm” Claudio Cordero plays the rhythm guitar in a way that is common in Metal music. The combination with the broad keyboard layers and excellent drumming works very well. In the second part the wonderful vocal refrains, the soaring guitar and synth solo’s push the music towards a climax. The next track “Katrina Killed The Clown” opens with delicate vocals only accompanied by a piano and a fretless bass. Then the song develops into a delicious Neo-Prog song with lovely melodies and catchy vocal melodies. The delicate vocal parts and tasteful guitar parts on a bed of keyboard layers are very strong. For me the first highlight of the album. Then it is time for the title track “Wonderland”. The fine guitar work of Cordero in the second part of this song transport the music to a next level. “Final Fantasy” includes some wonderful melodies and classical keyboard atmospheres. You can find lovely vocal melodies on this track. It is a wonderful song. Talking about highlights, “Frozen In Time” is a great Neo-Prog song with strong instrumental parts and lovely vocal melodies. You can find a beautiful melodic guitar solo in this keyboard dominated track.“ Glittering Lights” with strong vocals is one of the shorter tracks of this album. Before the song with the French lyrics and the saxophone solo “Le Fil Du Temps” ends this album, we can enjoy “Eight Weeks”. It is an eight and a half minutes long track with delicate sung vocals and nice melodic guitar and synth parts. Love the steady rhythm section with the pulsating bass in this song. “Wonderland” is a fine album full of melodic Neo-Prog songs. The music is in overall keyboard dominated. The excellent guitar parts of Claudio Cordero gives the music of TNNE more power and a sometimes a heavy bite. Keyboardist Alex Rukavina is the force behind most of the compositions and the arrangements. All lyrics are by Patrick Kiefer who does again a wonderful job as vocalist. Because of the resemblance with the voice of Yogi Lang, I think that this fine album is not only food for No Name and TNNE fans but also will be appreciated by RPWL fans. My personal favorite is the song “Katrina Killed The Clown”. What a wonderful song, just love it. Neo-Prog fans are invited to check this fine album out.